Location: Solti Garden at Grant Park.. There are twenty-six life-size sculptures, thirteen made of aluminum and another thirteen of cast iron.. The Exhibition is sponsored by Bloomberg, Chicago Park District, Grant Park Conservancy and Icelandic Ministry of Culture. 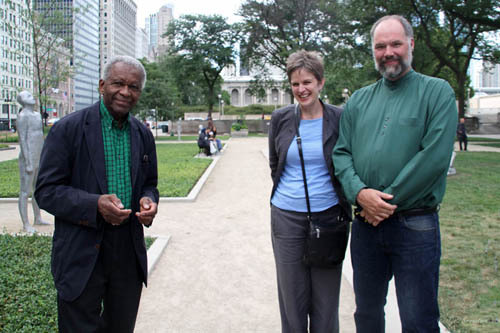 The Opening Reception was sponsored by DePaul University, the Zavett Family and the Grant Park Conservancy. This is the fourth venue for Borders. It was initially created for the Dag Hammarskjold Plaza in New York City. Then moved to Seattle and Dallas. Solti Garden, [in Chicago] was my natural choice and my first choice, as a site, here in Chicago. It somehow has the right spirit, the right atmosphere and the shape also is very important, because it is long and narrow. So in a way, to me, it feels like the show was made for this site. 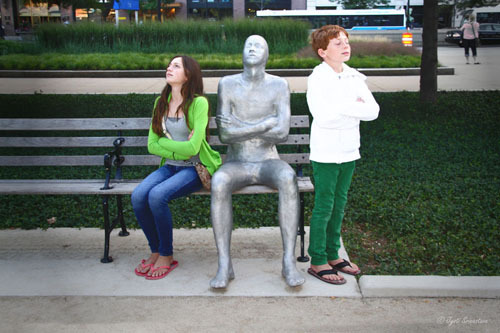 It’s not only situated in the great city of Chicago, but also, in kind of the center of the city sculpture area.. The figures very naturally found their place at this site. 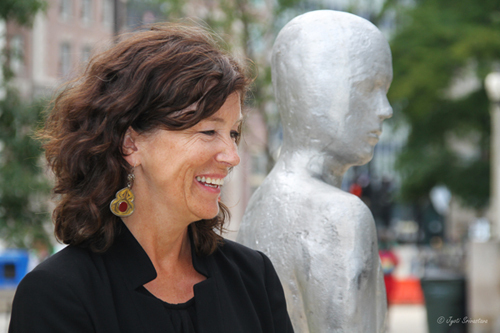 – Steinunn Thorarinsdottir /Aug 8, 2013, Opening Reception at Solti Garden. 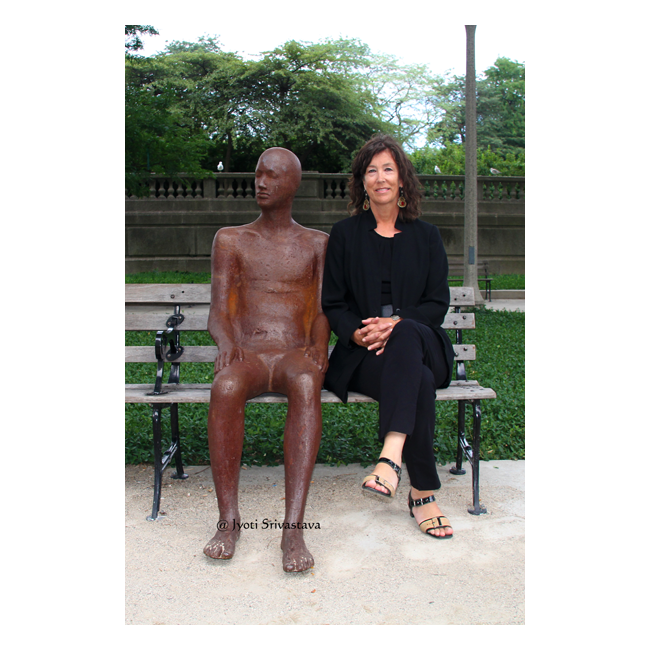 I have been working as a figurative artist for 35 years. For over past 15 years, the base of all these figures is my older son’s body. So in a way, I have been torturing him. But he gets paid. He has told me, he has this idea that when civilization changes and in hundreds of years, when people will start finding the relics of these pieces, people will think he was a God. This makes him very happy. – Steinunn Thorarinsdottir / Aug 8, 2013, Opening Reception at Solti Garden. 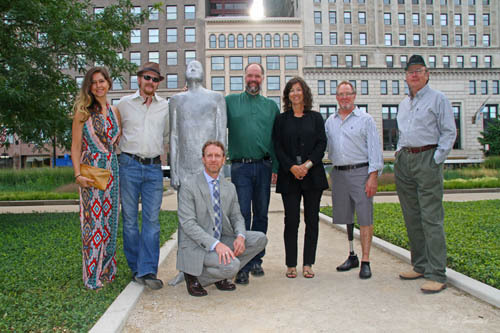 The Team that help install Borders in Solti Garden, Chicago. From left Ceyda Akosman, Kelly Ludeking, Adam Schwerner , Eric W. Stephenson, Steinunn Thorarinsdottir, Terry Karpowicz and Ted Garner. It was not very easy, as the truck that was bringing these sculptures from Texas, was late one full day. The truck broke down and then it was hit by another car. With the delay, it was not very easy. But they managed to install it on time. 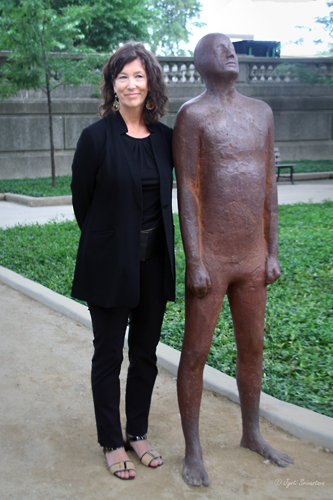 The entire speech by Steinunn Thorarinsdottir at the Opening Reception [August 8, 2013] at the Solti Garden, Chicago. Richard Howard Hunt with Eric Stephenson and Judith at the Opening Reception.. 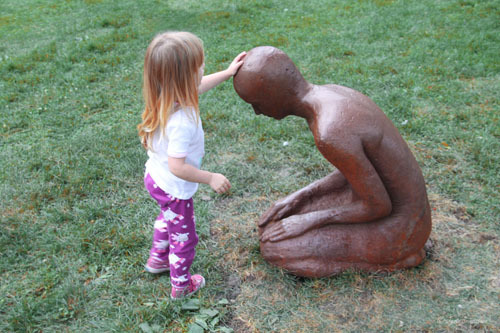 I had first seen Steinunn’s work two years back, at Nathan Manilow Sculpture Park, [Horizons click here..] and instantly loved it. 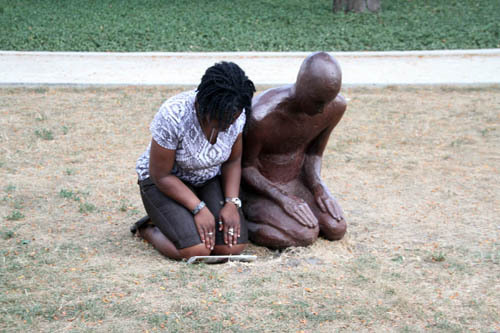 And when I met the sculptor yesterday, I instantly liked her too. Very approachable, pleasant and with a great sense of humor. Portrait with Art & Artists.. click here.. Portrait with National and International Artists.. click here..